Home News AP News Kavitha Quits Several Honorary Posts! Telangana Rashtra Samithi president and chief minister K Chandrasekhar Rao’s daughter and Nizamabad MP Kalvakuntla Kavitha on Saturday resigned from the posts of honourary presidents of several labour unions and organisations. 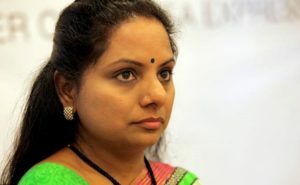 Kavitha had been serving as honourary president of the Telangana Boggu Gani Karmika Sangham (TBGKS), Telangana Electricity Workers’ Union, Anganwadi Teachers and Helpers’ Association and Association of Recognised Schools’ Managements all these days. She sent her resignation letters to the general secretaries of the respective unions. She said she was unable to spare time for the union activities as she was occupied with other responsibilities. Interestingly, her resignation comes close on the heels of her cousin and Siddipet MLA T Harish Rao’s resignation from the post of Telangana RTC Workers’ Union president a couple of days ago citing the same reasons. Following the resignations, media has started finding out whether there was any link between the decisions of Kavitha and Harish Rao in resigning from trade union posts. Naturally, they would not have resigned from their posts without any instructions from the chief minister. There is a talk that the KCR government is planning to impose serious curbs on the activities of various trade unions in the coming days to prevent strikes and agitations in the wake of his plans to privatize Singareni Collieries and RTC. Naturally, KCR would be in an embarrassing position, if his own kin head the union leader posts. Next articleNaidu Cries Foul Over Modi Budget!